the dusk zone: 'Dhu Everything..
"In Hinduism, 'sadhu' is a term for a mystic, an ascetic, practitioner of yoga and/or wandering monks. The sadhu is solely dedicated to achieving the fourth and final Hindu goal of life, moksha (liberation), through meditation and contemplation of Brahman. Sadhus often wear ochre-coloured clothing, symbolizing renunciation. The words come from the Sanskrit root sādh, which means 'reach one's goal', 'make straight', or 'gain power over'..."
....and those are the only ways I could ever hope to achieve moksha. I love the living of life too much to renounce anything! I'm more of a sadhu-everything! Ha! Some of my friends (who are Christian) have renounced 'pleasures' for Lent. For quite a few of them... it's facebook!! Speaking of facebook... I wish there was a 'blogbook' wall, exactly like the FB one... I find that so easy to use. I always have an fb window open when I'm at my computer and can see all updates and I love that so many of the blogs I read have Facebook pages and therefore updates that I can 'Like' or comment on. If you don't have an FB page, will you get one? I've got one! Actually... I have two! What I don't have is a twitter account and apparently I'm missing out? ...I get a lot of traffic via twitter...which kind of freaks me out! I mean... why???? Who's talking about me??? eeek. sadh- sandhya- dusk- dawn- kiran- there is a connection. I'm always on facebook too hehe. You have a great blog! Hahaha! You should totally get twitter... It might seem freaky n the starting but eventually it gets so easy to communicate, share, people must be sharing the links to your posts that they like! No one is talking anything bad about you, thats for sure. Else they will definitely have me to answer to (!) .... and I like the idea of being Sadhu-everything! 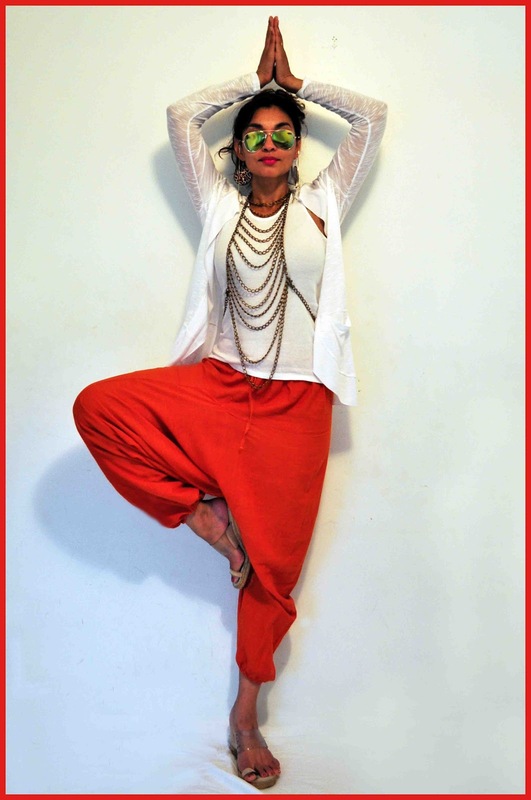 I would too fall in the same category ... And love the Sadhu pose and those red pants!!! Love the pose..I think its impossible for me to give up anything!! I also think moksha is a state of mind and renunciation is not the only way to get there. If you are at peace with urself and ur surroundings, isnt that moksha? So... if your blog views skyrocketed today, it's because I called up my ISP and said "I CAN'T LOAD THEDUSKZONE.BLOGSPOT.COM. FIX. IT." Teehee. Well, they did! And I must say I MISSED you!! I love the idea of giving up something for Lent. I remember my friends often giving up sugar (WHAT a good idea). Give up Facebook? Or anything internet related? I don't think I could do it. Twitter - you need to take the plunge! I love it. Possibly more than Facebook. It takes a while to get used to it as a medium and get involved in conversations, but once you do, it's an invaluable tool!